Old Faithful erupted behind me as I pedaled away from the visitor center and headed down basin, getting ready to lead the last ranger walk of the day. Though it’s officially known as the Geyser Discovery Stroll, we all refer to the 5:30 program as the Castle walk, named after the geyser where we assemble. I rode slowly, meandering among clusters of visitors on foot, and headed up the little hill towards Castle. I was a little surprised that no one was waiting on the path alongside its massive, twelve-foot-high cone—not only was it almost time for a popular ranger-led program, but in about twenty minutes we would enter the eruption window, that two-hour period during which Castle was predicted to erupt. Since Castle erupts only about once every fourteen hours, it always attracts a crowd when it’s due. Everyone chuckled, and we got started. 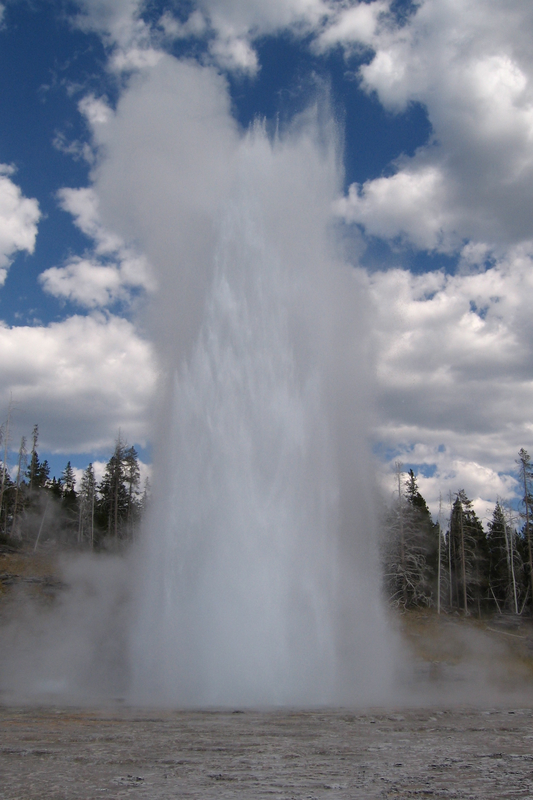 I described Castle Geyser’s impressive eruption—though it isn’t as high as Old Faithful, Castle can last for forty-five or fifty minutes altogether. It begins by jetting spurts of water seventy feet or more into the air, keeping this up for fifteen to twenty minutes. Then it gradually transitions into its steam phase, during which white steam gusts out of the vent at such high velocity that it produces a hollow roar. It’s quite a show. Unfortunately, it seemed unlikely that we would get to experience Castle that evening. It wasn’t quite ready to erupt just yet, and this was a ranger-led walk—we couldn’t afford to wait for the whole hour and a half at this one point. Besides, I was secretly holding out hope that we would get to see an even more exciting geyser. Located a quarter of a mile farther down the boardwalk, Grand Geyser is the largest of the handful of geysers that we can predict. Its eruptions last ten minutes or so, throwing water as high as 180 feet—at least on a really good day. It typically erupts about three times per day, and the midpoint of its prediction window fell near the end of my walk, giving us a very good chance of seeing the geyser’s spectacular eruption. I was hoping we’d be fortunate—in part because visitors love it when they get to see such an amazing show, and in part because I hadn’t seen Grand myself yet this season! As we wound our way slowly towards Grand, we passed a number of other erupting geysers. My group was openly amused by my delight at seeing little Tilt’s Baby, a geyser right at a corner of the boardwalk that sprays onlookers with its eight-foot eruption. Though Tilt’s Baby isn’t truly a rare or even particularly uncommon geyser, I’ve only been in the right place at the right time to see it on a handful of occasions. We crossed the Firehole River and came up the gently-sloping boardwalk to a tightly-packed cluster of geysers called the Sawmill Group. The eponymous Sawmill was churning and spitting away right next to the boardwalk, putting out enough spray that we had to trot past it to avoid getting too wet. Sawmill is a very active geyser, erupting about a third of the time that you walk past it; its frequent and lengthy eruptions make it a visitor favorite. Better yet, Sawmill wasn’t the only erupting geyser here today: both Tardy and Spasmodic were spouting, as well. My group loved Spasmodic, with its numerous small vents and its two frothing pools, all splashing vigorously. We had dallied on this early portion of the walk longer than usual. The eruptions were exciting and everyone had lots of questions—and I wasn’t motivated to move the group on too quickly, since I wanted to give Grand a chance to erupt while we were within easy viewing range! As we rounded the bend and headed towards that most show-stopping of performers, a loud fwoosh and a fountain of water that lifted all our heads marked the start of Grand’s eruption! It was perfect timing. We positioned ourselves at the south end of the viewing area, and basked in the mighty geyser’s eruption. Ten minutes later, as Grand concluded, many of the visitors watching from the boardwalk applauded the geyser’s display. I love it when people do that: it’s such a spontaneous, genuine gesture of appreciation at having seen something wonderful. I gathered up my group again, and found their faces aglow with smiles. “Nice work, Ranger!” one man said. “Can you do that again?” said another, grinning. We walked on past Grand, the group members chatting amongst themselves in the amiable way that comes of shared experience. We stopped for a while at Economic Geyser—dormant since the 1920s, with a couple of short-lived reactivations in the late 1950s—to look at historic photos and think about changing human uses of the national park landscape. Continuing to Beauty and Chromatic Pools, we had fun spotting grizzly bear tracks (several weeks old, but still clearly visible in the low-angle light of evening) and talking about the variety of different life forms present in the thermal areas. Standing at Beauty Pool, I had my back to the hot spring, and so was looking back towards Castle when it began its eruption. I pointed it out to my group, then glanced at my watch: we were nearing the 7:00 PM time that marked the end of the walk, and we were nowhere near my usual stopping place at Grotto Geyser. I suggested that, instead of continuing on the usual route, we turn back and enjoy Castle’s eruption. The group enthusiastically agreed, and we started back the way we had come. I was a little nervous about this. If Castle had a minor eruption, it could stop before we got close, and that would be more than a little anticlimactic. But we were a group of good walkers, and we made it back to Grand in good time. I paused there to reassemble everyone and make sure no one was struggling to keep up. There’s a great view of Castle from there, too, and so everyone had their cameras out for pictures. We mobilized again and were just coming back through the Sawmill Group when Old Faithful erupted, half a mile away. We happened to be at a wonderful vantage point for taking in the dual eruptions of Castle and Old Faithful, with the warm glow of the westering sun illuminating the jetting columns of water and billowing clouds of steam. It was a magnificent sight. It was one of those evenings when circumstances conspired to make my job easy. I felt as though I could have said anything, or nothing at all, and people still would have loved the walk. The real art of my work comes into play when the geysers aren’t erupting—when people cannot see the things they hoped or expected to see, but end up appreciating new wonders on the landscape in ways they never anticipated. Isn’t it strange how you will never know in how many important ways you may have affected individuals on your walks? I love that you put it that way, with an implicit assumption that people are changed as a result of my walks. That’s certainly the result I hope for–it’s the result everyone who does this sort of works hopes for. But mostly it really is a matter of hoping: we talk to a great many people, then send them back out into their lives, and never see them again. Every now and then, I get letters from visitors that describe some way in which they’ve changed because of a program I led. That means so much. Yes, Cathy, when I was writing that I was thinking about how the curator of the San Diego Museum of Natural History let me into the “up-stares” to help me research my 9th grade science project on flies. I am sure it was an insignificant thing to him but to me, it changed everything. You see, I had been going to the museum as often as I could get my mom to take me. I could not contain my imagination as to what wonders lay up those stares that had the sign on a chain, “No Admittance – Museum Staff Only”. It was every bit as wonderful, every bit as full of wonder as I had imagined.